Been thinking about this every since i saw the Trick flow FE heads and their raised rocker stand location. Many years ago, when i had the means to do so, I cut up a junk ford iron head to see how far i could raise the roof. Once i had figured that out i chucked another donor head into the mill and used a 1/2 inch ball mill to raise the roof about .250-300, maybe a bit more, its been so long ago i don't remember the specifics. The head also got a larger intake valve and some bowl work to make it all work. I put some JB weld in the floor to raise it as well as to help the short turn out a bit. Like i said, i don't remember the specifics, but what i do remember is i was rewarded with some very impressive flow numbers on the flow bench, comparable to some very nice aftermarket BBC heads that we had just tested up to ~.500 lift, a bit more in the .300-.400 range. Back then i was just playing around. Always wish i had had the time and resources to get it finalized and a motor built. Fast forward to today, every time i see the TF heads i cant help but think how much easier it would be to do the same thing. with Jays intake adapter getting an intake to fit would be a lot easier, not trivial i imagine but certainly do-able. Raise the roof say ~.300 or so maybe more , fill the floor to match. Obviously you could only go so far before you either had gasket issues or you weakened the rocker stand bosses. 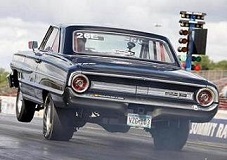 You can do that to a Blue Thunder head or an unfinished Edelbrock ProPort too. I have an iron C8AE-H head I experimented with 30 years ago. I ground right through the intake roof of the port and built it up with weld, sawed the exhaust port right off, using bondo for filler I stuck the port back on 3/4" higher. Just did one port for each, two of the other intakes and exhausts were done different ways and one was left stock. This was just for flow testing and would never have worked on an engine. Wow, sounds like you went full cowbell on that head. I know Blair does all kinds of mods to the Edelbrock pro ports to make some serious power. What intrigues my about the TF heads is the raised rocker location, looks like you could go a lot higher with that port before you had to modify the valvetrain. The exaust port doesn’t offer a lot of flexibility for the average Joe though.. Cutting it off entirely is something I hadn’t thought of, I remember reading about the cleveland guys doing that back in the day, seems like it would actually be easier on an FE Head since most of the port is on the outside and no water to worry about. If only I had a spare $2k sitting around to experiment with.. The Trick Flow is a pretty good "out of the box" head. If you want to go to extremes, the Ed Pro Port is the best available blank canvas. The rocker pad on a TFS isn't significantly different than current Pro Ports. You can get the floor pretty high without welding or filling the Pro Port. I think if you could buy a raw TFS, without the programs run, it would look very much like an uncut Pro Port. Cast by the same folks at the Ef foundry. I do that when the budget allows. I have programs for that sort of thing. It requires a billet manifold, or one of Jay's "higher than a High Riser" bases, and then a fabricated spider. It also requires relocation of the bar to get the geometry to work right. Sometimes it is better to just make a new and altered subplate for the T&D. It is better to raise the roof, for several reasons, but it gets expensive in a hurry. Last year I designed an intake port that will fit within the Medium Riser valve cover, and can work with a reasonably modified cast BBM tunnel wedge. It only missed the extensively raised port by 7-10 cfm. There is more going on than just flow, but made a lot of power, and we got within about 40hp of the raised port/billet tunnel ram, with a high Medium Riser/modified BBM cast intake. My opinion is that for the cost/benefit if it, most of my Pro Port customers will choose the Race MR Pro Port and cast intake, if they want more than the Street Pro Port can produce. Those who want the "max effort" will still go for the high port, but not many. The cost of working the intake manifold, and moving the pushrods on any of the "other than stock" locations is a factor. It is possible to get to 800 hp with compression, using ports that are only 1/8" taller than MR location, and 1.400 wide in the stock side-by-side position. The point being that the vast majority of an end user's goals can be reached WITHOUT relocation, expensive intake mods, and offset rockers. I reckon it just depends on what the goals are, and what the budget is. 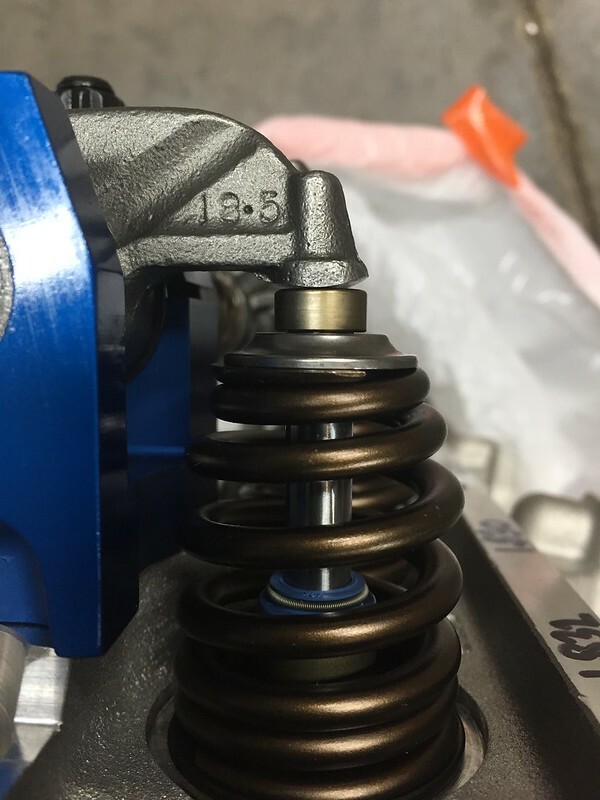 The right camshaft for the use, and an efficient, fairly stock location port can do pretty well if the port is made right, once inside that stock flange location. For .600 lift or less, the benefits of raised/moved ports are minimal. The LS intake port in the Trick Flow head is very good for the money. They are a little small in some places for 482+ cubes. I have fixed a few sets of these, and end up with a little less cost to the customer than the Street Pro Ports. I can get the intake side almost as good, but the exhaust side and 1.625 valve still lacks a little. Seems like no matter how we go, it is still a "get what you pay for" situation. I think I may be rambling now......but back to the original post......for most applications, the really high ports are not worth the cost difference. At 482+ inches and .700 lift + solid roller territory, a relocated MR height can really work. Only the really serious apps will warrant raising ports past what a MR valve cover rail can house. For .600 lift or less, the benefits of raised/moved ports are minimal. That's good info, thanks Blair. Kinda puts things in perspective. It is possible to get to 800 hp with compression, using ports that are only 1/8" taller than MR location, and 1.400 wide in the stock side-by-side position. That is impressive, wondering if you might elaborate a bit, " with compression " i assume means somewhere north of 13-1+?
" 1.400 wide in the stock side by side position " what do you mean by "side by side" position? I assume the port is just 1.4 wide ? Very impressive for a somewhat stock port location i think. An 1/8 inch taller port is a pretty minor change, the fact that the rest of the port past the relatively stock inlet location can be made to support that kind of HP is really cool. 1.400 wide and not offset to either side of the OE position..... The goal there was to not get the port so wide, and then have to go through the woes of moving the pushrod tube. With basically a third of our FE cylinder head port stuck up in the manifold, a person needs to consider that. Port entry angle is critical. I often see a nice looking head, and a nice looking manifold that match dimensionally, but have a "dogleg" of an entry angle. On "compression", at 12.5:1, I have seen 785 hp with the SPP. More will obviously do better. I have a combo almost ready to dyno now that I have never done before........it is 14.5 c/r, Street Pro Port, .800 lift, and 520 inches. Whatever happens, that will pretty much be the end of the scale for my " stock location" intake flange offerings. I am not going to speculate.... will know in a few weeks. I'm kinda curious myself. I hear a lot that FEs just can't compete with the 385 series, but excluding Pro Stock type heads, at 540 inches and less, I beg to differ. This 520 I'm getting ready to run has an aftermarket block, CNC head, and a cast intake with a light port match. Will be interesting to see how it does, considering it is significantly less cost than the "high end" FE induction price-wise. I often see a nice looking head, and a nice looking manifold that match dimensionally, but have a "dogleg" of an entry angle. The stock ports are not bad at all for the era they were built in, but the intake ports all face away from the carb, rather than towards it. So getting around that dogleg presents a problem. Love hearing that sort of thing, and can’t wait to see the results of that 520. Thanks for taking the time to answer my questions, one of the reasons this forum is so great is so many knowledgeable people willing to contribute. I hear a lot that FEs just can't compete with the 385 series, but excluding Pro Stock type heads, at 540 inches and less, I beg to differ. In any venue where rules hold the engines to a reasonably comparable state of modification (Stock, Super Stock, EMC, etc) the FE does very well against the Lima family engines. You might want to look up Wally Booth and Al Mathon. There are also a couple of different guys currently experimenting with variations of a raised port Z-11 and DCI is doing a modern RA V head too...O/T by application but the same core concept. Maybe I missed it but I saw no mention of Jay's own TP spaced, MR port, Hiriser heads. There's no reason a real head could not be 3D printed...and it would eliminate any issues with foundries. You have the model, you just need the right printer. Man Jay, the floor being 2" above the deck is "up there". Impossible with any available or formerly available casting. That will be a major departure from " conventional " FE heads. I'll have to try a set of those when they are available! So then we'd have LR, MR, HR...then SHR (super high rise )? I assume this would require a raised rocker pad and valve cover rail, even higher than the factory HR? It sounds like these would not be usable in a shock towered car. I need to amend a statement I made on the rocker pad height on the TFS heads. That pad is .300 taller than the valve cover rail. The advantage I see is a deeper root for the helicoils. The disadvantage is that for conventionally mounted rockers, one should mill the stands, or shim about .200 under a High Riser stand to get geometry in the right vicinity. 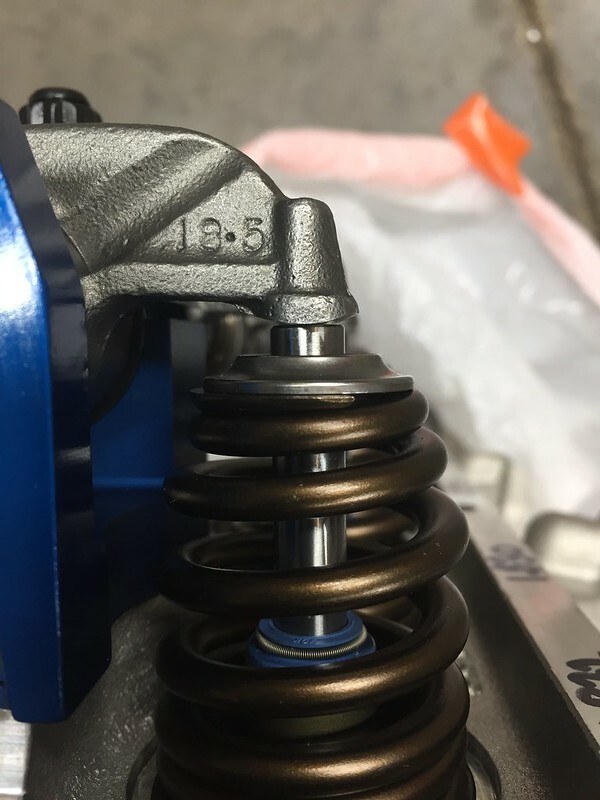 The valves are 5.500, so the standard height stands aren't going to net a good geometry without putting the shaft centerline around +/- .050 from OEM. I have not yet held a TFS head in my hands. Are you saying that they are using a valve that is 5.500 and a rocker pad that high on their production part? Seems counterintuitive to do that. I can see raising the pad a little (especially if they had been reading the rocker geometry thread here) but increasing the valve tip height negates most of the benefit there. Like your observation - only gain would be more thread engagement on the rocker helicoil??? 3.940" from deck surface to intake side of rocker stand pad. I have 2 sets here: one will get a set of T&D streets, the other gets a set of non-adjustables with end stands. I'm gonna wait until I can get the heads on the block and take a closer look at things, but I agree, something's gonna have to change. Normally, a non-adj rocker is sitting on the intake side of the valve stem. Quite a bit of difference with these heads. I usually end up with about .100 shim with the non-adjustable OE rockers. On the one I have here, it looks like I will mill somewhere between .180 and .200 off the rocker stands and use no shims. ARP makes all kinds of studs with different thread lengths. I will use a 1" thread length on the bottom to get more engagement.